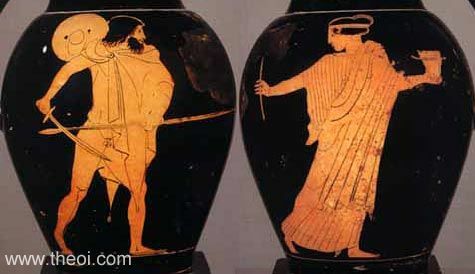 Odysseus approaches the witch Circe with sword drawn. The hero wears a petasos cap and chlamys cloak, and holds a sword and spear in his hands. The witch carries a mortar and pestle (or wand). This is a montage of two photos of the vase.